Cats - Now and forever! Based on the beloved poetry of T.S. Eliot, Cats tells the story of the annual gathering of Jellicle Cats where one special cat is selected to ascend to the Heaviside layer. 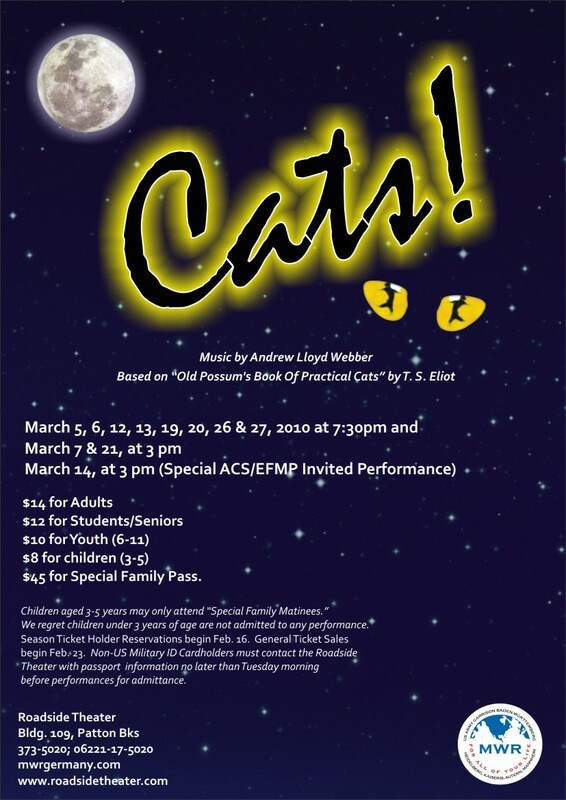 A magical evening of song and dance, Cats is a true musical phenomenon. It is one of the world's best known and best loved musicals, thrilling audiences of all ages. You must be in the theater no later than 30 minutes before the show. At that time we release unpaid reservations and offer them to the Waiting List. We will call you name as soon as tickets become available. Each show we have a several unpaid reservations and no-shows. Also, many people who are on Waiting Lists who do not show up. Because of this, we have had "Sold Out" shows with very long Waiting Lists that ended up with empty seats. Rarely do we have to turn people away. Therefore, if you are on the Waiting List, we really encourage you to come to the performance. We will make every effort to seat you. However, there is still no guarantee we will have seats for you. For those of you with unpaid reservations, we do encourage you to call our office to pay in advance with your credit card. Keep in mind, we cancel all unpaid reservations one-half hour before the curtain and offer them to the waiting list. If you have not paid for your reservation and are delayed and do not collect your tickets 30 minutes before the show, you may not have a place to sit. We hope this clarification is helpful. We look forward to seeing you all at CATS." More information is available at the Roadside Theater; Bldg. 109, Patton Bks; by calling DSN 373-5020 or Civ. 06221-17 50 20, Tues.-Fri. from 12:00-5:00 p.m.; or at www.roadsidetheater.com.